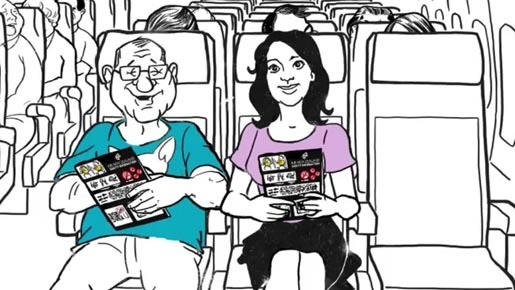 Air New Zealand has produced a new animated in-flight safety video featuring Ed O’Neill (Modern Family, Married With Children) and NZ actress Melanie Lynskey (Up in the Air, Two and a Half Men). Hand-drawn and filmed during the process, the video depicts an airline safety pamphlet as it comes to life. The film also includes cameo apearances from Snoop Dogg, Barack Obama (with a subtle nod to his support of gay marriage), Australian prime minister Julia Gillard, French president Francois Hollande, Olympic athletes Mahe Drysdale and Valerie Adams; captain of the New Zealand All Blacks rugby team Richie McCaw, Queen Elizabeth II, Chinese TV presenter Kevin Tsai, and Hong Kong musician Chet Lam. In recognition of the increasingly important Asian market, Kevin Tsai, a high-profile Chinese television personality who was named one of GQ China’s Men of the Year in 2011, and Chet Lam, a well-known musician and composer based in Hong Kong, also feature. This is the latest in a series of campaigns commissioned Air New Zealand, following on from in-flight videos such as The Bare Essentials, and series starring Lindsay Lohan, Richard Simmons, David Hasselhoff and former mascot Rico. One lucky winner who can identify five or more of the celebrities featured in the Ed & Melanie’s Safety Sketch, in the Air NZ online competition, will win a trip for two around the world via Air New Zealand’s social media hub, theflyingsocialnetwork.com. The Ed & Melanie’s Safety Sketch video was created at Albion, London. Music is Naked and Famous track “Punching in a Dream”.